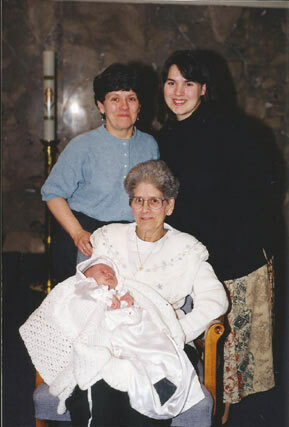 Four generations with Emilienne, Mémère Pitre seated. Born in 1921, my grandmother Emilienne (nee: Leger) Pitre loved Bingo and sleeping in, but not her name. When my older cousin wanted to name her youngest baby girl in her honour, my grandmother asked her not to, so instead, they settled on the name Emilie. Four years later, in 1999, when it came time to name my second daughter, nearly one year after my grandmother’s sudden passing, I slipped the name Emilienne in as my daughter’s middle name, convinced that my grandmother would forgive me under the circumstances. Mémère Pitre, as we called her, was quiet, but when she got angry – LOOKOUT because her cold sharp stare could cut through you like a laser. I guess you could say that I sometimes took her for granted in my youth, especially since the tomboy in me found my grandfather so much more fascinating. But that changed as I got older, especially in my teens when I developed an interest in our family tree; I would often drop by to visit and quiz her and she’d help me look through her old photo-albums. She had it really rough as a child, her mother passed away when she was only five, and there were too many children in the family for her father to take care of on his own so most of them were sent to live with friends or relatives; she and one sister were sent to live in an orphanage. This was an awful experience and she ran away several times. Luckily, she finally wound up with loving relatives. But times were tough still; they didn’t have much money and they were faced with all sorts of hurdles. She met my grandfather when she was a teenager and they married in 1939; she was only 18. They already had two children by the time my grandfather was sent to battle in Europe during WWII. He was gone four years and when he returned, it wasn’t long before she was pregnant again, this time with my mother. Given that both she and my grandfather grew up in large families, I once expressed surprise at how they had only had three children, to which my grandmother explained that it was very important for my grandfather to only have as many children as he could afford to provide for. They were married nearly 45 years when he passed away in 1984. She spent the next decade playing Bingo, visiting friends, travelling, and unfortunately, in and out of the hospital with various heart ailments. It broke her heart to move in with relatives when it meant leaving behind the house that she and my grandfather had shared; the one he built, where they raised their family. In 1995, I spent many hours with my grandmother, interviewing her about her life, and what came out of it was her story that I helped her put together as a gift to all her grandchildren that Christmas. But I got so much more than a story from that experience, the real gift for me was the time that project allowed me to spend with her , to get to know her on an entirely different level. I came out of those visits, feeling closer to my grandmother than I ever felt before and truly grateful for the opportunity. November 1997, she held my first born. The following year, she attended a party we threw for my baby’s first birthday. A couple weeks after that, she was rushed to the hospital with a ruptured intestine … the doctors didn’t expect her to make it through the operation, but she was stronger than they thought. Only, she never did wake up. The whole family spent the next hours waiting; some told her that it was okay to let go, others prayed that she’d have the strength to hold on, we all cried and in a discrete whisper, I shared with her a most intimate secret – she was the first to hear that I was expecting another baby. I guess deep down, I secretly hoped that the news might give her the strength she needed to pull through. She passed away November 28th, 1998. So much has happened in the past 15 years, yet, sometimes, it seems like only yesterday. I still miss her. Today, September 18th, she would be celebrating her 92nd birthday. Tonight, I will tell stories to my children about the great-grandmother they never got to know, we’ll eat cake, blow out the candles in her honour and celebrate her life. Charline Cormier-Pellerin is the Associate Editor of SNAP Moncton and a freelance writer with a regular weekly parenting column in the Moncton Times & Transcript. She can be reached at Pelle@nbnet.nb.ca or followed on Twitter.